Joseph David Keery (born April 24, 1992) is an American actor and musician. 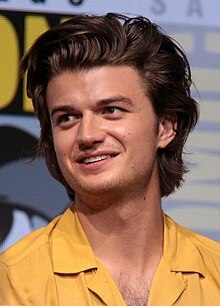 He is best known for portraying Steve Harrington in the American science-fiction horror web television series Stranger Things, as well as a contributing musician for the American psychedelic rock band Post Animal. Keery grew up in Newburyport, Massachusetts, where he attended River Valley Charter School for elementary and middle school, and then Newburyport High School. He is the second of five children and grew up surrounded by 4 sisters. During his younger years he attended Theater in the Open, a performing arts camp at Maudslay State Park, but ultimately began acting in high school, performing there initially at his sister's insistence. Keery went on to study at The Theatre School at DePaul University and graduated in 2014. After graduating from DePaul, Keery went to over a hundred auditions. Before his breakout role in Stranger Things, Keery appeared in a KFC, Domino's, and amiibo commercial, and had roles in Empire and Chicago Fire. His first appearance in a full-length film was in Stephen Cone's indie, Henry Gamble's Birthday Party. In late 2015, Keery was cast in Stranger Things. He initially auditioned for the role of Jonathan, but later sent in a tape for his character, Steve. He was promoted from recurring cast to a series regular for the second season of Stranger Things, which premiered on October 27, 2017. Aside from acting, Keery is also a musician. He is one of the guitarists for Chicago-based garage and psych-rock band Post Animal. Their debut full-length album was released in October 2015. The band's sophomore album, When I Think Of You In A Castle, was released in April 2018 and saw Keery contributing his guitar playing as well as vocals. As of 2019, Keery is no longer a touring member of the band. Previously, Keery released music under the name "Cool Cool Cool". ^ Sullivan, Jim (26 August 2016). "NHS alum Keery finds fame in Netflix's 'Stranger Things'". The Daily News of Newburyport. Retrieved 9 July 2017. ^ "Joe Keery Biography". Retrieved 20 March 2018. ^ a b c Greene, Morgan (17 August 2016). "'Stranger Things' pulls Ravenswood actor into its orbit". Chicago Tribune. Retrieved 9 July 2017. ^ Daly, Kelly (28 July 2016). "Who To Watch: Joe Keery". Chicago Splash. Retrieved 9 July 2017. ^ Jung, E. Alex. "Stranger Things' Joe Keery Agrees That Steve's Jeans Were Very Tight". Vulture. Retrieved 30 October 2017. ^ Bradley, Laura (13 December 2016). "What Millie Bobby Brown Really Wants from Stranger Things Season 2". Vanity Fair. Condé Nast. Retrieved 2 January 2017. ^ Hillyer, Alec (14 August 2016). "Review: Post Animal's Post Animal Perform the Most Curious Water Activities". Medium. A Medium Corporation. Retrieved 9 July 2017. ^ Cooper, Leonie (5 August 2016). "Listen To Steve From Stranger Things' Tame Impala Style Psych Band". NME. Time Inc. UK. Retrieved 9 July 2017. ^ "When I Think Of You In A Castle". www.polyvinylrecords.com. Retrieved 2019-02-19. ^ "I'm Not Smart, by Cool Cool Cool". Cool Cool Cool. Retrieved 28 November 2016. ^ "Screen Actors Guild Awards 2017: Complete Winners List". ABC News. January 30, 2017. Retrieved November 3, 2017. ^ "2018 SAG Award Nominations: See the Full List". Retrieved 11 January 2018. This page was last edited on 12 March 2019, at 16:10 (UTC).